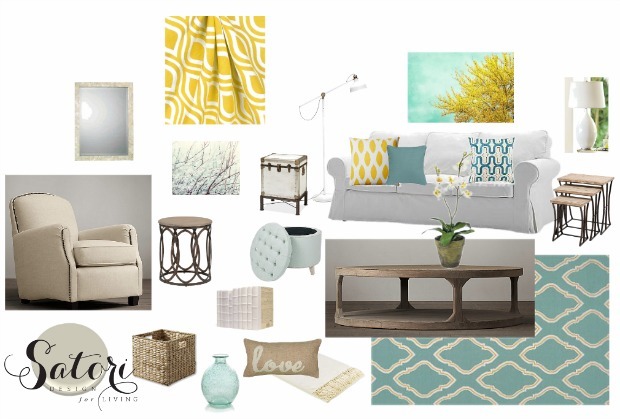 Which living room color palette would you select for this space? Are you more drawn to blue, green or yellow decor? Weigh in! A couple of weeks ago, I finished up a living room e-design that I’m finally getting around to sharing with you. Starting with a freshly painted room in Benjamin Moore Revere Pewter (a soft greige), as well as beige wall-to-wall carpet, my client’s wishes were to have a fresh & pretty, modern country living room to enjoy with her dog at the end of a long work day. Such a fun project to work on! 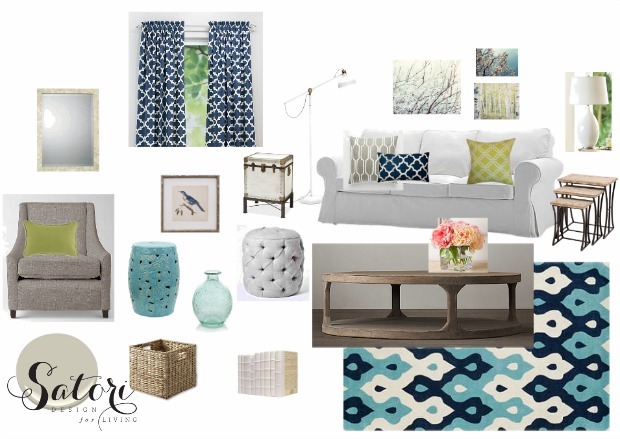 We decided to keep the furniture neutral for longevity and incorporate pops of color with the artwork and accessories. With that in mind, I came up with 3 varying color palettes simply switching out a few decorative pieces. 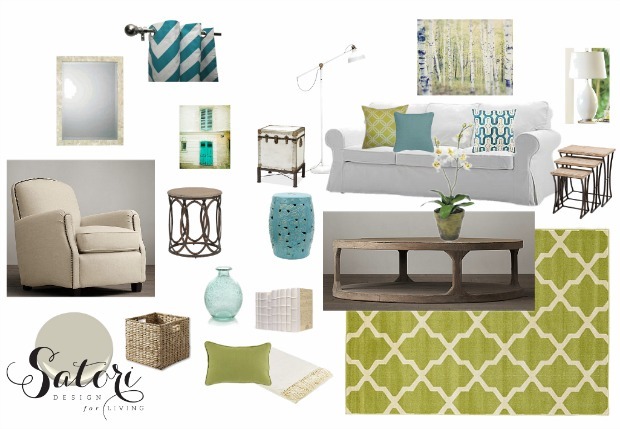 All of these color ways will bring life to Corrine’s living room, but her favorite is the green and turquoise. I can’t wait to see the after photos, you? So, if you had to pick a living room color palette from above, which would it be? Looking for more design ideas? Check out my Client Projects board on Pinterest. Note: Client’s details (such as budget breakdown, profile, etc.) have been excluded for confidentiality reasons. This plan is a snapshot of one of our E-Design packages and does not showcase all components in order to respect the fees associated with our services. All designs and images are property of Satori Design for Living. Please contact me if you have any questions. Love those colours Shauna! It’s amazing how different a space can look just by changing up the accessories and keeping the main basic pieces. That’s what so great about doing it online- easy to make the changes and see what each one will look like before making any purchases! All of these are so pretty! You make this seem so easy! Thanks Katie. It’s something I love to do (unlike hosting kid’s b-day parties LOL)! You must have had a lot of fun creating these different design collections. I think my favourite is the green and turquoise. I also love the new look of your blog! It’s hard to pick just one because they’re all so fresh and colourful, but I really love the green and turquoise colour palette. I’ve been trying to incorporate more of those colours into our apartment’s decor. They are soothing and happy at the same time. I love all of them but I am addicted to blue and white. It is so crisp. Nice collection that you have put together. If I had my pick it would be the first one, the blue and white! How can you go wrong with any of these though? They’re all really good choices!